It’s not every day you get to hang out in a blanket fort. And this is not just any blanket fort. It's a sprawling, impressively constructed tunnel of colourful sheets, high enough that you can almost stand up – taking over a big part of the Gardiner Museum’s third floor. It may look like a child’s fantasy but it was thought up by two innovative adults – alumna and urban planner Sara Udow and artist Jennie Suddick, otherwise known as the Crazy Dames. The duo started Crazy Dames as a nod to urban theorist Jane Jacobs – who would have turned 100 this year. “She believed in ideas of participation and exploration in neighbourhoods and the importance of getting community members involved in city planning,” says Udow, who holds a masters in urban planning from the University of Toronto. At the time, Jacobs’ forward-thinking ideas were met with criticism from her male counterparts, who called her a “crazy dame” with equally crazy ideas. “We are reclaiming the name to pay homage to her and to recognize her achievements and explore her ideas through an artist’s studio,” says Udow. That’s how they ended up at the Gardiner Musuem. 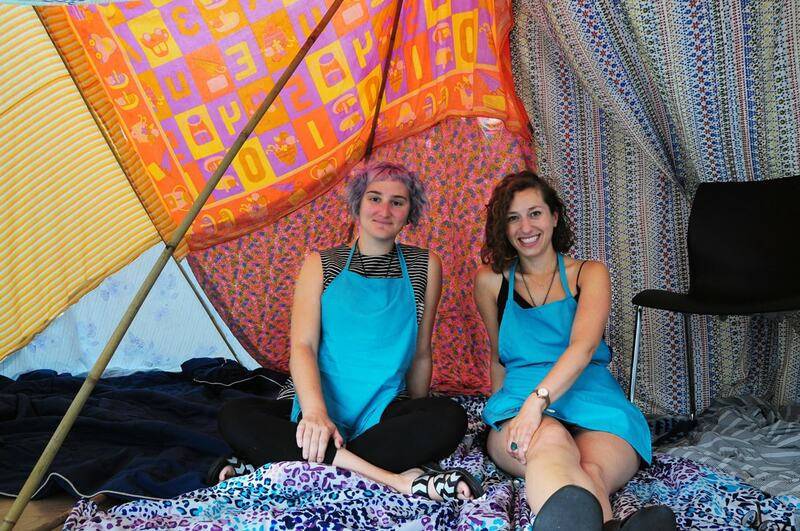 Udow and Suddick have set up shop until August 5 for an event called “We Built This City.” They’re inviting the public to explore different ways of interacting with the city through crafts, a panel discussion, walking tours (they call them “walkshops”) and, of course, fort building. “We wanted to have an event where people came together and discussed with one another what they wanted to create and engage with that imaginative process that has many associations with fun and play but also with claiming a space and making it your own,” says Suddick, who is also the event’s artist-in-residence and an assistant professor at OCAD University. Suddick and Udow say they want to reach demographics, communities and age groups that are outside of the “usual suspects” – the often-retired, affluent people who participate in planning meetings. “To have a format where people feel like their voices will be heard or that there’s a place where they can express their voices – like a forum where they’re part of a bigger conversation – is really important,” says Suddick. On this particular day, they’re shining a spotlight on the urbanists-in-training – a group of summer students from Maximum City. Founded by U of T grads Josh Fullan and Eleanor Rae, Maximum City is a year-round program, Maximum City teaches kids about urban design and architecture. Earlier that week, the students went on a walking tour where they discovered parts of Toronto they never knew existed and interviewed people about what the city means to them. “We asked them to go back and think about what they learned and come up with an idea of what a museum of Toronto may be,” says Udow. The kids then presented their proposals to an audience of fellow students, parents and museum visitors. Some big ideas included a graffiti wall, a replica maze of downtown Toronto and a barber shop. “I liked trying to find out more of what represented Toronto for the museum,” said 11-year-old Maximum City student Annalise, whose favourite part of the city is the waterfront. After their week at the Gardiner Museum, the Crazy Dames are taking their show on the road – heading to a conference in Copenhagen to talk about the results of this week’s events. After that, they’re running a small arts festival in Florence. And they’re bringing the blanket fort with them.